Since internet for schools became mainstream in education, the supply of services was almost entirely in the domain of the Local Education Authority. Since the demise of the Harnessing Technology grant, schools are faced with the ever-increasing costs of internet connectivity with very few alternative options. A common obstacle which is put in front of schools by Local Education Authorities when looking to move away from their existing internet provision is the authorities suggesting to schools that they will be unable to access essential services (such as SIMS) if they do not purchase internet provision from them. LEAs cannot legally insist that schools purchase internet connectivity from themselves in order to access essential services. The LEA has a duty to schools to provide access to essential services such as SIMS, from outside their network, if asked to by the school. Connectivity solutions from Broadband4 offer fantastic value and significant cost savings over traditional broadband for schools offerings from Local Education Authorities. A typical primary school could save up to 70% over a solution from an LEA. With the number of academies and free schools on the increase, the need for robust and reliable alternatives to LEA provision is on the rise. 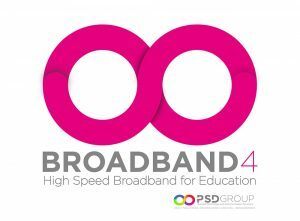 Broadband4 is part of The PSD Group, who have been providing ICT solutions to schools for the past 35 years. Our product set has been designed to provide all the services and solutions required by education as part of a complete package. All Broadband4 products are offered as managed services, whilst allowing schools to control as much or as little of their service as they like. School’s with an onsite ICT team may wish to control all aspects of their internet access and web filtering in house, whilst smaller primary schools with limited onsite ICT resource can entrust all aspects to our dedicated account management and engineering teams. Whichever you choose you can rest assured our teams are available every step of the way. Broadband4 source connectivity services from best of breed UK service providers and manage all filtering and associated products within our own UK datacentre facilities in multiple UK locations. By maintaining a high level of control over the services we provide and reducing the reliance on third parties, means Broadband4 can ensure we maintain a consistently high level of service for our customers and allowing us to respond quickly and efficiently in the unlikely event of a service issue. All Broadband4 connections come with an SLA. Leased lines offer 99.997% uptime and FTTC connections offer a maximum 20-hour fix. FTTC connections from Broadband4 include enhanced care on both the PSTN (Phone Line) and FTTC (Broadband) portion of the circuit. All Broadband4 services are monitored by our Network Operations centre and any faults are handled directly by our engineers.